We love seeing your beautiful smiles every day and sharing a laugh while catching up on the latest news. Because we appreciate your continued loyalty to our Bellevue dentist office and team, we love it when we have the opportunity to reward that loyalty. As partners in your dental health, we want to provide you with important information we know you want and need and we are constantly thinking of new and creative ways we can supply it. So, we are excited to share a new digital download that provides information we know you will be happy to have – How Are Dental Implants Placed? 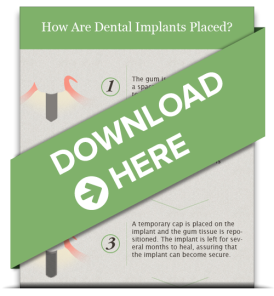 Take the mystery out of dental implants with our FREE infographic. It gives a step-by-step description of what you can expect when dental implants are being placed.